AMSOIL INC. revolutionized the filtration industry with its introduction of AMSOIL Motorcycle Oil Filters. For the first time exclusive nanofiber technology, the same technology used in the Abrams M1 tank and other heavy duty applications, was made available for automotive applications. Now, AMSOIL has made this outstanding new technology available for motorcycles. Because the nanofibers in AMSOIL Ea Motorcycle Oil Filter media are so small, there are more pores per square inch, allowing for higher dirt-holding capacity and lower pressure drop compared to traditional filter medias. Thinner media fibers produce more uniform pore size distribution, improving the filter’s overall ability to capture and retain particles. Clean oil is vital to engine performance and durability. Oil must lubricate, cool and clean the engine as it circulates. In order to remain effective, it must be filtered as it cycles. The filter is connected to the engine sump, which contains the oil pump. Full-flow filters pass all the oil output from the pump through the filter. 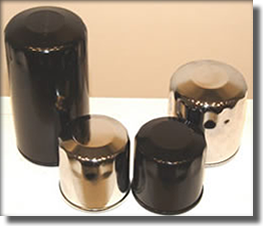 The function of the oil filter is to remove the contaminants introduced into the lubricating oil and prevent them from reaching sensitive engine parts without restricting normal oil flow to the various points requiring lubrication. Internal sources of contamination include wear products from the rubbing surfaces of the engine, blow-by gases leaking past the rings of the pistons and degradation of the oil itself. A filter must perform well in the areas of efficiency, capacity, flow and life. AMSOIL Ea Motorcycle Oil Filters provide unsurpassed protection for motorcycles, ATVs, four-stroke personal watercraft, four-stroke snowmobiles and four-stroke outboards. AMSOIL is producing an initial offering of 16 Ea Motorcycle Oil Filters manufactured for the most popular power sports applications. Eight of the 16 filters are chrome plated. Please contact us with any questions regarding the Dealership and Preferred Customer option and we can explain them both in more detail and also answer any of your product or technical questions. Thank you for your interest in AMSOIL products and for confidence in our technical and business expertise. 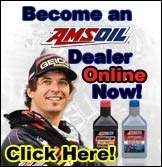 AMSOIL is our business and our passion and it is our goal to ensure your complete satisfaction. XSite pro video - Build your very own website like the one you are on now!